Convert EPS to JPG, PNG, or other image formats in batches, make graphics suitable for the web. Convert hundreds of images at once with just a few clicks. How to Convert EPS to JPG image format on Mac? What is the EPS image format? EPS, the Encapsulated Postscript, is a common file format currently widely used widely in desktop publishing. Also known as PS with preview images. It is a cross-platform standard format. It is similar to COREL DRAW CDR, ILLUSTRATOR AI and so on. An EPS file generally consists of a PostScript language text file or on behalf of TIFF and PICT described as components, The EPS file extension is not the same on different platforms. on the PC platform, It is .eps, on the Macintosh platform, It is .epsf. It is mainly used for store vector and raster images. Almost all of professional graphic design software is compatible with EPS, The file may be opened with Photoshop, Illustrator, Corel Draw and Freehand. The JPG format is the internet’s most popular image format, Files can be compressed to the smallest format. The JPG format is widely used, particularly on the web and in CD-ROM books. All kinds of browsers support the JPEG image formats thanks to the smaller file size, and faster download speed. Portable Network Graphics, referred to as PNG, is the latest online image file format. It is 30 percent larger than a GIF. PNG can provide a small lossless compressed image file. It also provides 24 and 48-bit true color image support. Advantages: PNG supports high-level lossless compression, supports alpha channel transparency. supports interlacing. And PNG is supported by the latest web browsers. Disadvantages: Older browsers and programs may not support PNG files. As an Internet file format, and there is a less compression compared to JPEG. PNG provides less compression. As an Internet file format, PNG does not provide animation support. GIF format supports multi-image files and movie files. The GIF format supports multi-image files animations and movie files. Why do you need to convert EPS to JPG, PNG or other image formats? If you want to upload an EPS image to a blog, website, social media or if you want to view your EPS image on smart phones, tablet and other mobile devices, you usually need to convert the EPS file into a JPG, or PNG or another popular image format, It will easy to view, and the file is smaller. It’ll be easy to view and smaller. Method 1. Open EPS file with PHOTOSHOP or AI software , and then click the menu to choose Save As, and then select the JPG format on it. 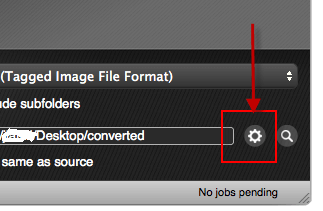 If you are using ACDsee, open the EPS file, and then click the Image Conversion to convert your EPS to JPG or PNG file. This method assumes that your computer has PHOTOSHOP, ACDsee installed, and you can skillfully use the software. These are suitable for professional designers, more expensive. and can only convert one file at a time. If you want to convert multiple EPS images to JPG format, or you are not a professional designer, we suggest you use the following method. Method 2: Convert EPS To JPG with an easy image conversion software such as iWinSoft Image Converter. 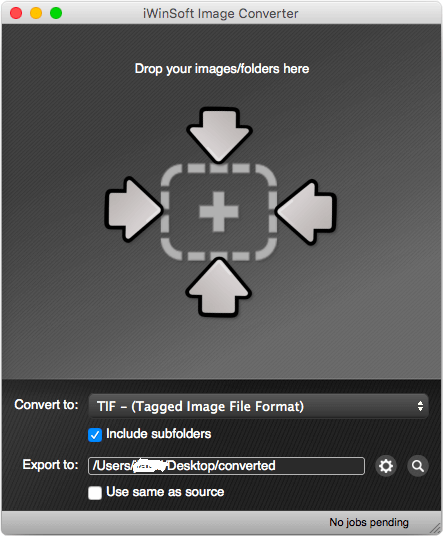 You can batch multiple convert EPS to JPG, PNG, GIF or other image formats. Just a few simple clicks, without complex operations. Anyone can very easily convert EPS files to JPG, PNG and etc. In addition, iWinSoft Image Converter can not only convert EPS to JPG, PNG, TIFF, PDF, and some other popular image formats, but also convert RAW photo formats and other vector (PDF, SVG, AI, WMF) as well. All this can be done with just a few simple steps. First,You can download the iWinSoft Image Converter software and install it on your Mac computer. After the installation is complete, open the software, and you will see the following interface. Click the "Convert to" drop-down list and choose an output format. Here we choose JPG as the output format. 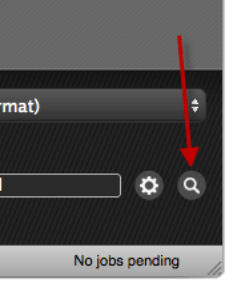 Click the gear icon on the interface and select a folder where you want to save the output JPG images. When the output format and the output directory is set up, Drag and drop your images or entire image folder into the main interface of program. Now you can view saved JPG images by clicking on the magnifying glass icon in the lower right of the interface. As you can see, converting EPS to JPG is very easy, fast? Don’t believe it? You can download a trial to try it yourself. 1. How to Convert DNG to JPG or PNG format? 2. How to Convert NEF to JPG or PNG format?